Palau is an underwater paradise, with more than 700 coral species and 1,500 fish species. Three converging, nutrient-rich ocean currents fuel Palau’s rich biodiversity and create some of the most diverse dive experiences on the planet. Located just two hours by plane southwest of Guam, the tiny island nation is within easy reach of the USA. Palau’s shark-filled drift dives, up-close manta encounters, and unique jellyfish snorkel are world-famous. You may also experience blackwater diving and – if you’re lucky – swim with whales, dugongs or crocodiles. I travel to Palau to photograph the colorful reef fish, fish larvae and the spawning aggregations. Thousands of fish gathering to reproduce in one place is one of the most exciting events you will ever witness. 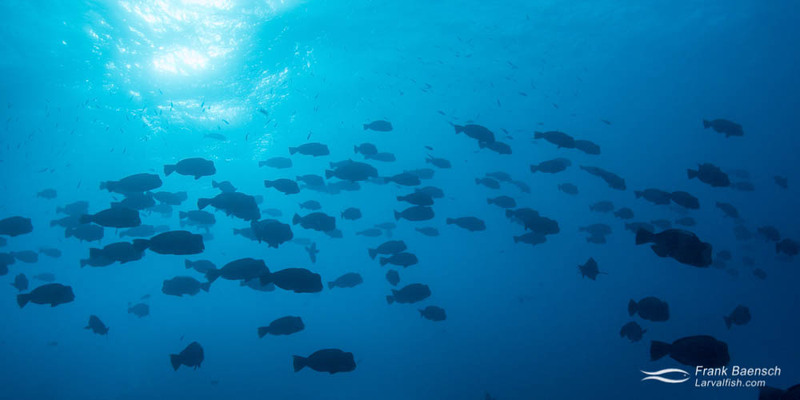 Every month, 5-6 days leading up to the full moon, thousands of bohar snapper (Lutjanus bohar) aggregate early in the morning to spawn at several deep reef sites in Palau. After gathering near the reef, the massive school forms a tight ball and swims out into the blue water. As the school rises into the water column, tornados of rubbing fish bodies erupt toward the surface, producing white clouds of gametes everywhere you look. Twin-spot red snapper (Lutjanus bohar) spawning aggregation. The fish swim back to the reef, then back out into the blue – spawning again. They repeat this pattern many times. The chaotic spectacle goes on for almost an hour. Spawning occurs over several days and climaxes around the full moon. Bumphead parrotfish (Bolbomeotpon muricatum) aggregate to spawn around the time of the new moon in certain reef passages in Palau. These large aggregations consist of hundreds of fish, mostly smaller adults. Multiple males (have pale forehead) will spawn with a single female. Spawning takes place in the early morning. The spectacle lasts for about one hour, before the fish separate. Bumphead parrotfish (Bolbometopon muricatum) spawning in the blue water off a deep reef in Palau. Camouflage groupers (Epinephelus polyphekadion) aggregate in specific reef passages for several days around the new moon during the summer months. Males compete for and pair with females during the daylight hours. Spawning takes place late in the evening with currents ripping out to sea. The action starts with two fish racing up several meters into the water column. In a flash they turn, release milt and eggs, and bolt back down to the safety of the reef. A few seconds later a second pair races up in unison. Then a third and a forth. Within minutes, the reef erupts like a firework display. Sharks race in to hunt on the distracted fish. In less than half an hour, hundreds of groupers have reproduced. A pair of camouflage groupers (Epinephelus polyphekadion) spawning at night in Palau. Females can easily be distinguished from males by their massively swollen belly filled with hydrated eggs. Multicolor angelfish (Centropyge multicolor) in Palau. Bumphead parrotfish (Scarus perrico) aggregate at dawn just before spawning on a reef in Palau. Mandarinfish (Synchiropus splendidus) releasing eggs. Mandarinfish spawn every night - sometimes several times. Lucky fish 🙂 Palau. Bumphead parrotfish (Scarus perrico) spawning in the blue water off a deep reef in Palau. Pink skunk clownfish (Amphiprion perideraion) inhabiting a beautiful purple-tipped anemone in Palau. Twin-spot red Snapper (Lutjanus bohar) spawning aggregation. Palau. Two remoras attached to the carapace of a green sea turtle (Chelonia mydas) in Palau. Some cultures used remoras to catch turtles. A line is fastened to the remora's tail, and when a turtle is sighted, the fish is released from the boat. It usually heads directly for the turtle and fastens itself to the turtle's shell. When the remora is hauled in so is the turtle. Hawksbill turtle (Eretmochelys imbricata) bolts down from the surface in Palau. Head on shot of hawksbill turtle (Eretmochelys imbricata). Palau. Two soft corals attached to a giant giant clam (Tridachna gigas) in Palau. Over-under scene of jellyfish under mangroves in Palau. Squid (Cephalapod sp.) at night. Palau. Reef squid (Cephalapod sp.). Palau. Juvenile banded mantis shrimp (Lysiosquilla maculata) reflecting off the surface on a blackwater dive in Palau. Squid (Cephalapod sp.) under rain drops. Palau. Pink anemonefish (Amphiprion perideraion) in Palau. Sqirrelfish reef scene in Palau. Striped large-eye bream (Gnathodentex aureolineatus) and bluestripe snapper (Lutjanus kasmira) often school together. Palau. Epaulette soldierfish (Myripristis kuntee) schooling in Palau at sunset. Male squarespot anthias (Pseudanthias pleurotaenia) in Palau. Blue-girdled angelfish (Pomacanthus navarchus). Palau. Spotfin lionfish (Pterois antennata) pair. Palau. Schooling bigeyes (Priacanthus arenatus) in Palau. Red snapper (Lutjanus bohar) spawning aggregation. Palau. Black snappers (Macolor niger) feeding on plankton in Palau. A rare burgess butterflyfish (Chaetodon burgessi). Palau. Bluestreak cleaner wrasse (Labroides dimidatus) tending to bluestreak fusilier (Pterocaesio tile). Palau. Bluestreak cleaner wrasse (Labroides dimidatus) tending to bluestreak fusiliers (Pterocaesio tile). Mandarinfish (Synchiropus splendidus) pair in Palau. Titan triggerfish (Balistoides viridescens) protecting its nest. Palau. Exquisite Wrasse (Cirrhilabrus exquisitus) in Palau. Schooling blacktail barracuda (Sphyraena qenie). Palau. A male mandarinfish (Synchiropus splendidus) in Palau. Mandarinfish (Synchiropus splendidus), arguably one of the most beautiful fish in the sea. Palau. Skunk anemonefish (Amphiprion perideraion) trio in Palau. Skunk anemonefish (Amphiprion perideraion) peers out from its anemone. Palau. Chinese trumpetfish (Aulostomus chinesis) shadowing a blue-girdled angelfish (Pomacanthus navarchus) to obtain a meal. Palau. I photographed this blacklip butterflyfish (Chaetodon kleinii) larva as it was settling on the reef at night on a new moon. It's ready to transform into a juvenile. Palau. Settling surgeonfish larva on the reef at night in Palau. Moorish Idol (Zanclus cornutus) postlarva settling on a reef at night in Palau. Moorish idols settle on the reef at over 10 cm TL, about 5x the average size of a reef fish at settlement. Cardinalfish (Apogonid) on a blackwater dive in Palau. Juvenile African pompano (Alectis ciliaris). Palau. Candycane dwarfgoby (Trimma sp.). Palau. Redfin anthias (Pseudanthias dispar). Palau. Redstriped basslet (Liopropoma tonstrinum), a rarer deepwater species. Palau. Sea whip goby (Bryaninops yongei). Palau. Sleeping redlip parrotfish (Scarus rubroviolaceus) on a reef in Palau. Yellow-edged lyretail (Variola loutiorange) eating a lined triggerfish (Balistapus undulatus). Palau. Surgeonfish larva on blackwater dive in Palau. Squirrelfish larva on blackwater dive in Palau. Butterflyfish larva on blackwater dive in Palau. Juvenile jacks (Carangids) seek protection on a venomous medusa on blackwater dive in Palau. Head on shot of squirrelfish larva on blackwater dive in Palau. Bumphead parrotfish (Scarus perrico) spawning aggregation in Palau. Helfrich's dartfish (Nemateleotris helfrichi). Palau. A rare Colin's angelfish (Centropyge colini) on a deep reef in Palau. Harlequin grouper (Cephalopholis polleni) on a deep reef in Palau. Juvenile regal angelfish (Pygoplites diacanthus). Palau. Ringeye dwarfgoby (Trimma benjamini). Palau. Motion blur of bigeyes (Priacanthus arenatus) schooling over open reef in Palau. Schooling bigeyes (Priacanthus arenatus) on a reef in Palau. Motion blur of Yellowmargin triggerfish (Pseudobalistes flavimarginatus). Camouflage groupers (Epinephelus polyphekadion) aggregate to spawn on a reef in Palau. Camouflage grouper spawning aggregations have also been reported from Fiji, Indonesia, Malaysia, Solomon Islands, Tahiti and the Seychelles. A pair of camouflage groupers (Epinephelus polyphekadion) moments before spawning on a reef at night in Palau. A pair of camouflage groupers (Epinephelus polyphekadion) spawning at night in Palau. Juvenile jacks (Carangids) seek protection on medusa in Palau.